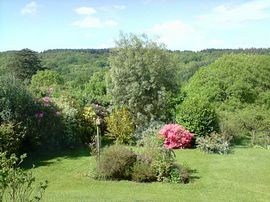 Nettle Bank is a comfortable and friendly family run B and B set in enviable gardens, affording uninterrupted panoramic views of Trinity Hill and Buzzard Valley - an Area of Outstanding Natural Beauty. 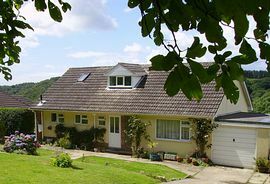 The beach, Jurassic Coast, River Cottage, Axminster and much more, are all just five minutes away. We aim to go the extra mile to make your stay as comfortable as possible. Lyme Regis, Charmouth, Seaton, Beer, Bridport, Axminster, Sidmouth and Honiton. Situated on the Dorset, Devon, Somerset borders, ideal for exploring some of the most beautiful countryside in England. Lyme Regis has received a massive injection of funds over the last two years, so it is even better than ever! Langmoor Gardens, where you can sit and take in the breath taking views of Lyme Bay, have been completely revamped, or visit the clean sandy beach, where the water is safe for children. Take an early evening stroll along the prom, where Neapolitan coloured beach huts can be rented. Tea rooms serving Dorset cream teas! Restaurants, bars and good food close to hand. Fossil Hunting trips are arranged in Lyme, also Mackerel Fishing trips. hill walking, Coastal path walks. French Lieutenants Woman, filmed at the famous Cobb. Seaton Tramway to Colyford and Colyton. Easy transport links by train from Axminster on the Exeter line, to London Waterloo. Exeter airport is approximately 30 minutes drive, mainly served by Flybe. The area is served by reliable bus routes, however, we can consider meeting you from the train station, by prior arrangement. Set in an Area of Outstanding Natural Beauty. Friendly family run B and B. 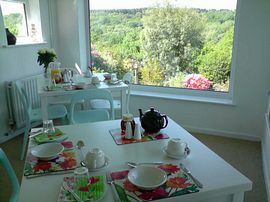 Breakfast room overlooking the gardens. Disabled Facilities: There are no disabled facilities. All rooms located on the ground floor. Pet Facilities: Pets are allowed. By prior arrangement only. 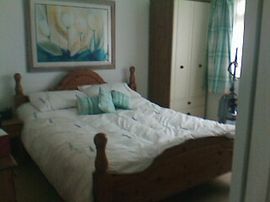 King size en-suite from: £30.00 per person per night. 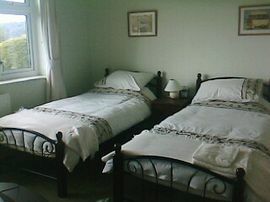 Twin with seperate private bathroom from: £27.50 per person. Single from £35.00 per person.